This is where you can get all the information you want about seeking help if you are living with a parent who may be abusing alcohol/drugs. This is a modest count because among those questioned many will deny their problem. Denial is the biggest problem among those suffering from addiction. How can you be certain that your parents are truly suffering from addiction? Just to be sure take the test on the right side of this page. Want to chat about it? Go ahead because this is where your anonymity will be preserved unless there is a life threatening emergency. We wish we could meet each one of you personally and chat with you eye ball to eye ball. And who knows maybe some day we will. Maybe someday we can plan a big convention. In the meantime we want you to read this disclaimer. We are here to give you information, to help you think through your problems with your parents and to tell you about reliable places where you can go for help. What you decide to do with our advice is your decision and we cannot be responsible or liable for your life nor any furthered problems you may experience in relation to what we have or have not provided. 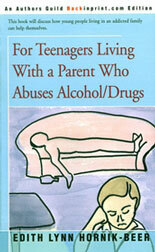 The AnswersForTeens.com website comprises only a small fraction of the helpful information found in Edith Lynn Hornik-Beer's book, "For Teenagers Living With a Parent Who Abuses Alcohol/Drugs." Click the book's picture on the left for excerpts, book reviews, table of contents and ordering information through Amazon.com.